Airing My Laundry, One Post At A Time...: Does Anyone Eat REAL Spaghetti Anymore? Does Anyone Eat REAL Spaghetti Anymore? Look, I get it. It's important to stay healthy. So I get why there are so many recipes for spaghetti squash or spaghetti zucchini floating around. But I'll be honest: I'll always stick to real spaghetti. I once tried the wheat spaghetti and nearly gagged. What is UP with that aftertaste? The only reason why I tried the wheat is because blogs and news programs were pressuring me into it. "Keep your family healthy! Switch to WHEAT spaghetti. You'll be surprised how similar it tastes to the other!" I was surprised all right. Surprised by the rancid taste. Even my kids were stunned. I tried to make it seem like it wasn't so bad, because if they liked it, I could make THEM wheat spaghetti and I could have the original. But Natalie took a bite and was like, "What is that taste in my mouth? It tastes like old paper bags." Tommy was all, "Why are these noodles brown like poo?" while holding one up with his thumb and forefinger. My husband took one bite and calmly pushed his bowl away. So no. Wheat spaghetti is NOT for my family. Then I noticed spaghetti squash, and I thought, "Should I?" but then I was like, "No," when I remembered the wheat spaghetti debacle. Plus there's no way I'd take the time and make spirals out of squash. I know my limits. Nothing beats a bowl of real spaghetti. And I know technically it's not REALLY real, because I didn't make the noodles myself, but who has time for that? I don't. It tastes even better with parmesan cheese on top. And then stick some garlic bread on the side. Carbs, carbs, carbs. I love you. 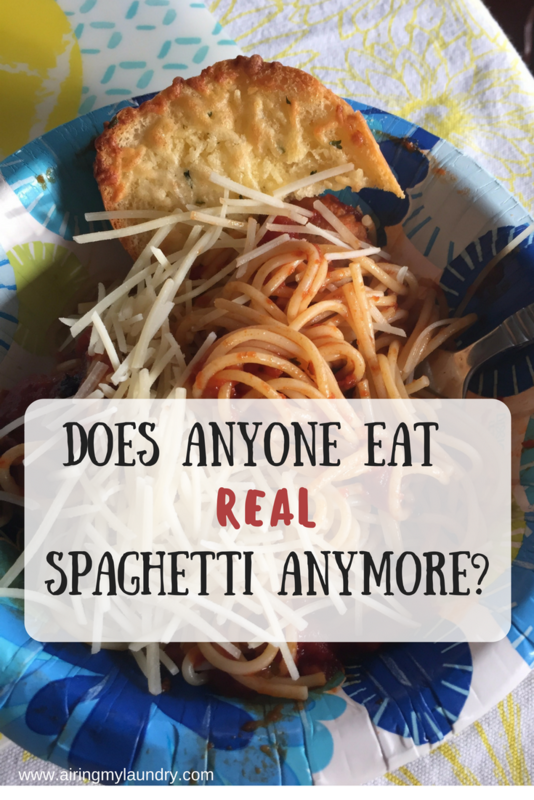 Do YOU still eat real spaghetti? I wish I liked it but I wasn't impressed. Ahaha loved this post - too funny!! Wheat spaghetti is awful, yuckity yuck!! I like zoodles, they're not too bad but yeah, gimme real spaghetti!! And carbs are totally okay! Yes! I love real spaghetti :) especially with homemade meatballs and lots of cheese. Ooo homemade meatballs are the best! Yes!!! I am all about real spaghetti! I just can't get on the zoodle bandwagon, they creep me out. Omg. Girl I love real pasta. F-that fake stuff!! Give me my noodles and I make this yummy butter sauce with garlic butter olive oil and Italian seasoning that is mmmmmm!! Of course, you have to eat garlic bread with it!! It's the side dish. Hilarious, I tried wheat spaghetti once and my family had the same response. But, Since i am vegan, I like the zucchini noodles. I still eat real spaghetti and always will! I'm willing to try zucchini noodles, but definitely not as a REPLACEMENT for my spaghetti! I have to eat gluten free spaghetti as I get bloated on the real stuff. To be honest I prefer pasta shapes because spaghetti is far too messy for me! `I have tried whole wheat spaghetti and I did not care for it. 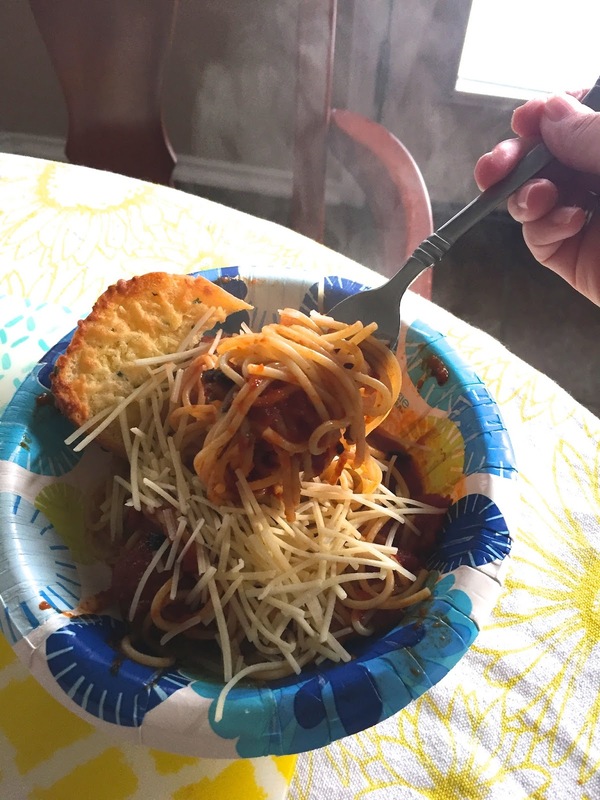 I have also tried spaghetti squash and loved it! So, I mix it up! My family loves them both. 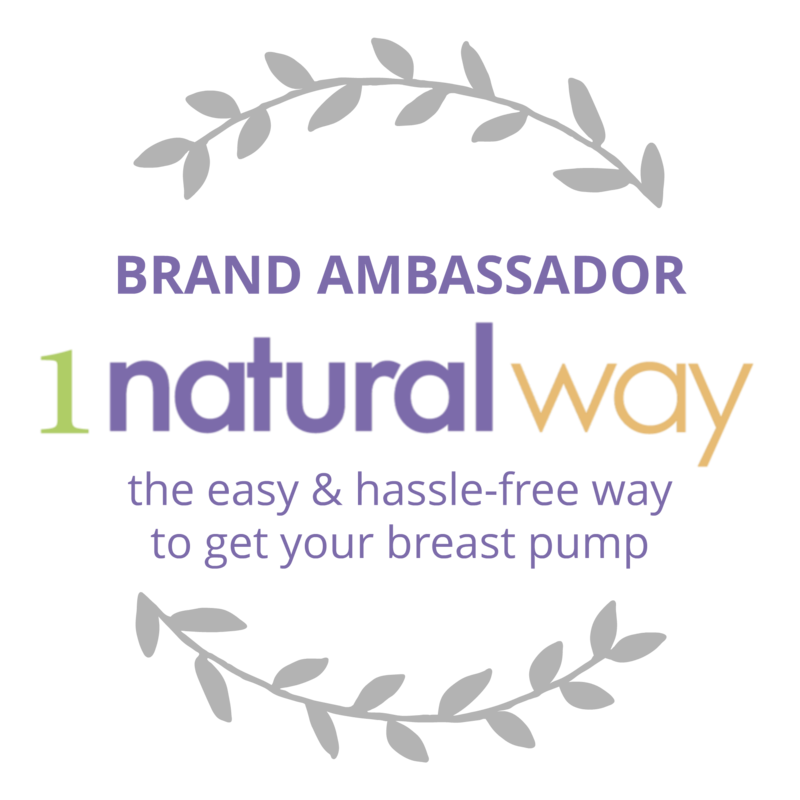 Your blog always has me laughing! My family eats real spaghetti too - as real as it can get with boxed noodles, anyway. Because like you, there's no way I'm going to be making real noodles. I agree with wheat spaghetti its yucky, lol but have you tried the Barilla plus pasta? I was hesitant but then I tried it it wasn't bad at all. tasted much better than the wheat, and had more protein, and omegas in it too. My family loves the real stuff too. The younger boys will eat chick pea pasta though. Preach It! We're tried spaghetti squash before, but I always end up being wheat spaghetti instead. The taste is just so much better, and nothing is wrong with whole grains in moderation! LOL loved this - to be honest, I love ALL the different types of spaghetti even if it is not really spaghetti like your own. You know I was surprised to learn that spaghetti is just the noodle itself, not actually the dish the way you and I prepare it! I learned this on a cooking show the other day, can't recall which one. I hear you though... I do! So many people telling us DON'T eat that EAT THIS and so on. Eat what makes you feel good, eat a healthy portion, take care of yourself and do your best not to over indulge but if you do not like wheat spaghetti don't let anyone tell you that you are a bad mom, or person if you don't eat it. Good job sticking to what you love! I hate wheat spaghetti so we still eat "real" spaghetti lol! I agree, nothing like original spaghetti which is the only type I eat. I only eat it at home too because they can't make it right in restaurants... too bland. Being from an Italian family, I have my own style and taste requirements. If spaghetti didn't exists I would be very sad. I do mix up white flour with brown sometimes, but spaghetti is like ice cream... don't hand me diet/ low calorie ice cream. I don't want that. I love squash spaghetti and my daughter goes to town on it. I think it's all in the flavors. I definitely still eat real spaghetti! There are numerous ways to cut calories and carbs in life, but pasta is where I draw the line. Nothing can beat the real one. I love my mom's spaghetti meat balls with lots of lots of cheese. It was so creamy and tasty! My family's (not mine) favorite food is spaghetti. They demand that I make it for them weekly. It is my daughter's favorite food of all time. She LOVES it and would eat it 3 times a day, seven days a week if I would let her. We tried the wheat spaghetti but it did not go over very well so we went back to the regular spaghetti noodles. They are very picky it when it comes to their spaghetti, I tried to switch up the sauce once and boy did they let me know that I was never to do such a thing again. So once a week I cook my family the spaghetti they love and we are all happier for it. We actually make real spaghetti around here. I don't even know what a slimmed down spaghetti would even be like. Mmmmm delicious i love eat spaghetti just with cheese and ketchup, they are my favorite ! This looks delicious. I have to be honest, I am all in eating healthy but there is one thing that we can eat and we have tried is so many time many ways, and that is eating wheat spaghetti. I remembered making spaghetti using wheat noodles my family and I end-up ordering food. I do the squash spaghetti but that's about it. Yes I do! Actually I make at least 2-3 pasta dishes per week. I guess I just love all noodles. I've liked almost every type of pasta I've tried (including whole wheat and spaghetti squash). Now we have to use gluten free noodles for my daughter, and thank goodness, we found a brand that tastes just like the real thing. All hail, spaghetti! What would we do without it? I think it's awesome to eat spaghetti without having to choose alternative ways to prepare it. I want the meaty ones too. Just the way my mom makes them. You're right, nothing beats real spaghetti! I still very much enjoy spaghetti without replacing them with any other kind of "noodles"! I think the classic recipe is amazing and nothing can beat it. We always make spaghetti for dinner. It is one of the cheapest meal ideas, and we are always trying to save money for our travels. It will very much be in our meal planning for a long time to come. Haha If i served my family the wheat stuff, they would look at me like I'm crazy too lol The real stuff can never be replaced! We actually prefer the wheat and high fiber versions, the zucchini ones are actually pretty good too but we have always eaten that kind of thing so I think our taste buds are just accustomed to it. My family are regular spaghetti eaters. I didnt care for the wheat either. Carbs are my hidden pleasure. I wish I could eat spaghetti more often, but I feel it falls to the way side when there are so many delicious choices out there. Thank you for sharing. Yes, I prefer plain ole regular spaghetti!! I tried spaghetti squash and was offended by the name when I ate it. LOL! It should be called squash strings and nothing else! It just isn't the same. Fun post!! The world will always need spaghetti! Just look at Italy. We got a pasta maker for Christmas! We make spaghetti every Saturday night. We don't make it gluten free or whole wheat but we make awesome egg noodles! That wrap around and around your fork! I've tried wheat spaghetti and don't really like it either. Thumbs up for real spaghetti! I do! I love real spaghetti. In fact, I love my carbs. I am not into all this carb-watching. I eat what my body wants and I am not obese. Thanks for a great post and not skirting the issue. I am not a fan of Spaghetti anymore. At one point, I used to love it but not anymore. haha i feel you on this. It think it just comes down to your lifestyle. I was raised in a whole wheat household so wheat pasta taste the same. But I definitely appreciate a good real spaghetti meal any day. I am a REAL pasta girl! I love my carbs. There is nothing like a big bowl of pasta with red sauce or Alfredo and a big hunk of garlic cheese bread! YUM! I am a REAL spaghetti girl with a salad and garlic bread on the side! Even eat it with milk - that's my perfect dinner! Hahaha normal spaghetti is the best!!!! I blog a lot of food and when asked for fancy pasta ideas from brands I'm always thinking to myself do people actually make these recipes. I know they get pinned, but really?!? Lol.... why make an easy dish complicated? What is "wheat spaghetti"? Spaghetti is spaghetti isn't it? I eat loads of pasta, I love it. I am not a huge Spaghetti fan but I love pasta. I eat wheat pasta! While trying out alternatives is a great idea, nothing comopares to the original. It's all about experimenting these days! We do eat regular "white" pasta from time to time, but if I'm being honest, we usually eat whole wheat. Like with anything, it's an adjustment because out tastebuds adapt. The same happened to me with rice! At first, I could stand brown rice. But with persistence, I went a long stretch without eating any white rice, and when I had it again, I thought it tasted like cardboard! This definitely made me laugh, though. I've totally been there!!! Ooppss anyone who says "I don't eat spaghetti" is definitely missing something from their childhood. I mean, spaghetti completes my childhood memories and even now that am adult. Spaghetti is life! I'm with you on that! Sure wheat pasta may be healthier but it does taste like brown paper bags; tried it once and threw it all out! Girl I am with you all the way! I love a real bowl of spaghetti. Plain ol' spaghetti is the best and what we serve in our home! It tastes good and its a whole lot healthier for you! This taste good! My husband and my son loves spaghetti. They can even eat spaghetti for a week. I hope eat real spaghetti. I have not tried squash spaghetti but it looks good. I'm sorry, but real spaghetti is actually made of wheat, so not sure what you mean by REAL spaghetti not being made from wheat. What is it made of then? The spaghetti looks great and delicious. I usually prefer wheat spaghetti, because it's delicious and healthier. Thank you for sharing. I eat wheat spaghetti and it tastes good. Thank you for sharing. Not a fan of spaghetti. Food has become complicated theses days. We love real spaghetti and I add lots of vegetables..so yum and filling! Sadly I'm gluten intolerant so can't eat "real" spaghetti. But I do love the vegetable alternatives! Always better to go with the original ones. Real spaghetti is better than the wheat version. We had spaghetti this week for supper. Easy to make, feeds a bunch and full of carbs. Whats not to love. I've never had homemade spaghetti no, but we love having spaghetti in our house for dinner sometimes. We always have to have parmesean cheese sprinkled on it, as well as garlic bread. I still make really spaghetti for my family. I actually just made some last night. I can't eat real spaghetti because I'm following a gluten free regime. I eat zoodles instead. You always crack me up. I like good regular ole' pasta. Why must everything be healthy these days? I may love to eat a healthy diet, but I cannot live without carbs. We typically have traditional spaghetti about twice a month, with many other pasta dishes in between. oh yeah, we still eat real spaghetti. I have never tried wheat pasta. I am actually making a pot this week for dinner! While we love our zoodles, we eat real spaghetti at least once a week in my house. Nothing beats it. I eat real pasta once every other month or so. Now that it is a treat, I really really enjoy it. The wheat was a no go for me as well. I have always liked spaghetti squash, but it has its time and place. Real spaghetti is definitely not the same as spaghetti squash. I don't like zoodles. Our family is split on pasta. I do not like it, it's just not my fav. But my kids could eat it for every meal. Unfortunately one of my girls is having issues with grains so she and I eat the nasty gluten free stuff and the rest get regular pasta. Carbs, carbs, carbs i love you lmao!!! There is nothing like real spaghetti, i love it and can't say no to it. Spaghetti is always a hit in my house! I have had it with wheat noodles or zucchini noodles and it is never the same as the tried and true classic meal! I love the convenience of spaghetti, but I don't really love it. However, I do love garlic bread! I love spaghetti and we have actually made our own from scratch. During my no detox I tried wheat spaghetti and needless to say, never again! I love healthy food and I love real spaghetti. I think that spaghetti are healthy, it depends only by its sauce! In Thailand at the moment and enjoying all types of noodles. Love em! I haven't tried this before but, is it sweet? It's something that deters me a bit. But, now I want to try it!!! My family loves spaghetti. We have tried all kinds of things but we always go back to the original. It's a cheap and easy meal also. I would still go for the original spaghetti. My favorite is the one cooked by my sister. Way better than the instant one. Yes I still like and eat original spaghetti, I make spaghetti squash but not as main dish but as sides with some spices and coconut. I will try to convert them into Indian dish though. Yes we do. 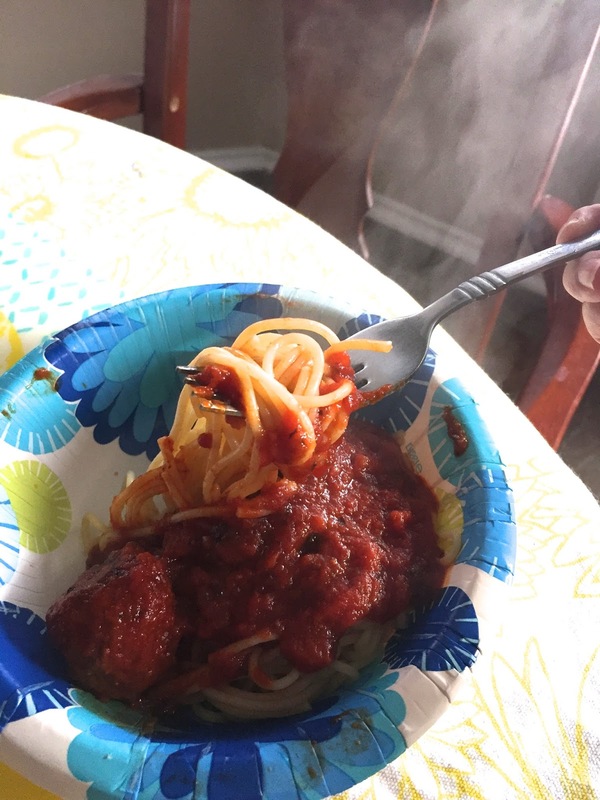 Spaghetti is one of my husband and kids favorite home cooked dinner. I like all kinds of noodles. Put a good sauce on it, and I'm good to go. My kids and hubby, however are all about the real noodles! I actually do...and I don't think I'm getting tired of eating real spaghetti anytime soon. However, I must have some toppings or stw around. Haha I was beginning to think I was the only one left eating real spaghetti :) There was a time I bought some of those gadgets to turn anything into spaghetti. Needless to say, it's gathering dust somewhere as I type. I've got to say, I'm an absolute sucker for good spaghetti! You've officially made me hungry! Looks so great and delicious. I'll definitely try this one. Thanks for sharing. I have actually never tried the real spaghetti. Have always bought the wheat spaghetti from the market as they are a healthy option. Will try out the real ones and I am sure after reading your post that it would taste better.